I don’t have any travel plans for this summer, but if I did, I’d love to pack my things into this stylish set of luggage designed by Anna Sui for Tumi. The line includes a carry-on wheelie suitcase, a tote bag, a laptop case, and shoe bags (not pictured). All of them are decorated with a black-on-purple design that could be a stylized butterfly or a pair of wings worn by an Art Nouveau angel. In keeping with my favorite designer’s characteristic style, the visuals are part 1960s psychedelia, part Aubrey Beardsley, and all Anna Sui. I don’t really need any new luggage, and Tumi’s prices are a little too steep for me, but I’m still enjoying the fantasy of carrying these stunners through Newark Airport, a place that could certainly use a little extra flair. 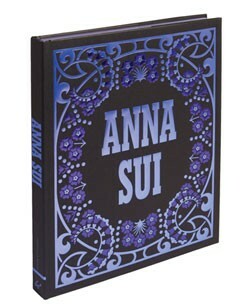 More affordable and just as enjoyable: if you’re an Anna Sui admirer and you haven’t already taken a look at this publication (from 2010), I encourage you to pick up a copy. I bought my copy of Anna Sui when it was first released and I’ve probably flipped through it on a weekly basis since then. Its contents never fail to inspire and delight me. Images via the Lucky website and Chronicle Books.